The description above was last updated on March 20th, 2014. As evidenced in the National Notifiable Diseases Surveillance System table below, 2014 was a frightening year for measles infection. The year’s total of 339 was the highest for 16 years and each of the first three months had higher notifications than any other month of the year. Although June and July notifications were only two and four less, respectively. Numbers of measles notification per State and Territory are tabulated here. In fact 2014 saw measles outbreaks across the globe. Australia experienced an influx of cases from Asia, Indonesia and the Philippines which resulted in unvaccinated children in Australia being infected according to the Department of Health. There were over 58,000 cases in the Philippines and 110 deaths, reported in February 2015. The USA experienced an outbreak with a similar cause. Over the course of the last year, there have been 610 reported cases of measles across twenty states. The reemergence of measles can be attributed, in part, to increased international travel where infected travelers have imported the disease into the United States. Particularly for 2014, many measles case clusters were traced back to the large ongoing measles outbreak happening in the Philippines. However, those in the United States who have become infected are generally unvaccinated, often by their own volition. Widespread use of the measles vaccine has dramatically reduced the numbers of cases in Canada over the past 45 years. But the recent outbreak in British Columbia is underscoring how the highly contagious virus can very effectively seek out groups of unprotected children. With respect to The Netherlands a paper by Woudenberg, et al, entitled Large measles epidemic in the Netherlands, May 2013 to March 2014: changing epidemiology examined two measles epidemics (1999-2000 and 2013-14) that primarily effected orthodox Protestants. 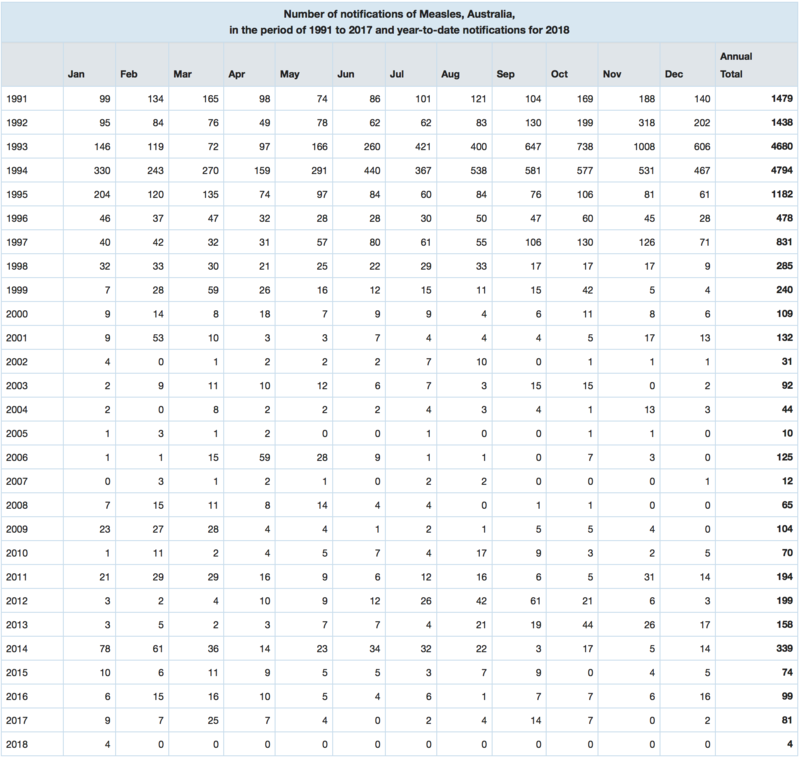 In the second epidemic, 27 May 2013 – 12 March 2014, 2,700 cases were reported. Molecular typing of the outbreak strain indicated a sequence indistinguishable from a strain first identified in Wales UK in the second half of 2012: the Taunton sequence. The first Dutch case was identified with the Taunton sequence in May 2013. By this time 900 identical sequences had been reported from the UK, France, Ireland and the Russian Federation, making a source country difficult to identify. The Netherlands outbreak was indicated as the source of outbreaks in Belgium and Canada and from Canada to the USA. Social ties between orthodox Protestants in the Netherlands and Canada leading to the spread of vaccine-preventable disease such as polio, measles, mumps and rubella to Canada has been previously reported. The number of individuals refraining from vaccination is insufficient to sustain endemic measles transmission in the Netherlands. Nevertheless, this situation does pose a risk to public health in the Netherlands and contributes to the worldwide spread of measles, thus forming an impediment to the elimination of measles in Europe and elsewhere. Amish communities and orthodox Protestants had a documented impact on reducing measles herd immunity in the USA, and Europe and Canada respectively and this was reflected in the 2014 outbreaks. 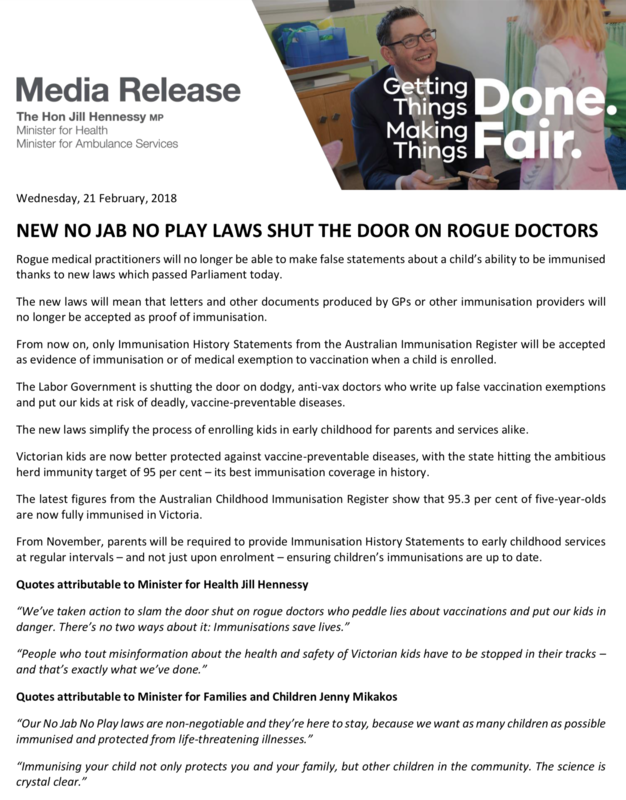 In Australia whilst small numbers struggle to meet immunisation requirements due to social hardship, the anti-vaccination lobby have for years worked hard to spread disinformation, driving down immunisation rates nationally. In June 2015 the ABC reported that the “surge” of measles the year before resulted in health authorities calling on Australians to ensure they were up to date with immunisations. If we compare this month’s present number of 4 notifications to the 78 for January 2014 it is clear measles notifications for the first month of this year are just over 5% of January 2014. The figure may rise slightly as further notifications for January reach the NNDSS but at this stage such a low figure is comforting. 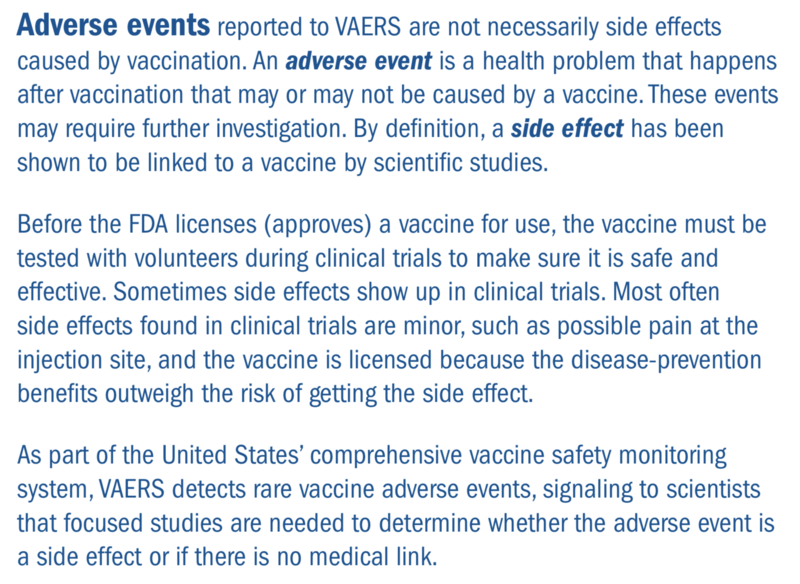 Still, there have been warnings specific to measles this year and late last year. Victoria issued a measles health alert (Confirmed measles case in Melbourne) on December 5th 2017. This was a single case acquired overseas and fortunately the national total for December 2017 remains at 2. The alert is now resolved. 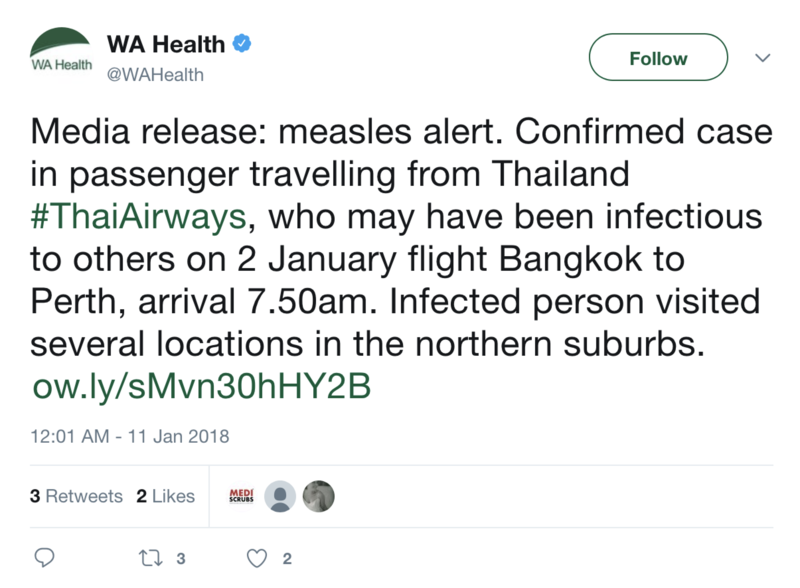 An identical measles health alert for Melbourne, differing only in where the individual travelled when infectious was issued on January 17th 2018 and remains active. This was reported in The Age on the same day. Passengers who flew from Dubai to Melbourne last Thursday have been warned that a fellow passenger has an “extremely infectious” case of the measles. Measles has an incubation period of seven to 18 days, so fellow passengers may develop symptoms from Thursday until the end of the month. As today is the last day of the month this status may change to resolved as of midnight. W.A. Health issued a very similar warning via Twitter on January 11th. This was reported the same day in Perth Now by Cathy O’Leary. We have no way of telling what measles notifications will be over the remainder of 2018. September and October last year saw a worrying spike in notifications in Melbourne. However we in Australia can be grateful for No Jab No Pay legislation. Countries at risk are evident in this January 12th, 2018 report, Measles in the EU/EEA: current outbreaks, latest data and trends – January 2018. Most cases were unvaccinated or incompletely vaccinated. The report included. The spread of measles across Europe is due to suboptimal vaccination coverage in many EU/EEA countries: of all measles cases reported during the one-year period 1 December 2016 to 30 November 2017 with known vaccination status, 87% were not vaccinated. In order to achieve the measles elimination goal, the vaccination coverage rates for children targeted by routine vaccination programmes should increase in a number of countries, as the vaccination coverage of the second dose must be at least 95% to interrupt measles circulation and achieve herd immunity. Presently a tragedy due to neglect, poverty, malnutrition and measles is unfolding in Papua, Indonesia. “As measles is easily prevented with a safe and inexpensive vaccine, these deaths should never have happened,” said Freddy Numberi, a former governor of Papua. [He added] that Papua has Indonesia’s lowest life expectancy and highest infant, child and maternal mortality rates. Without a doubt it is the same pattern across the globe. Measles epidemics will sprout wherever herd immunity is unsuitable. 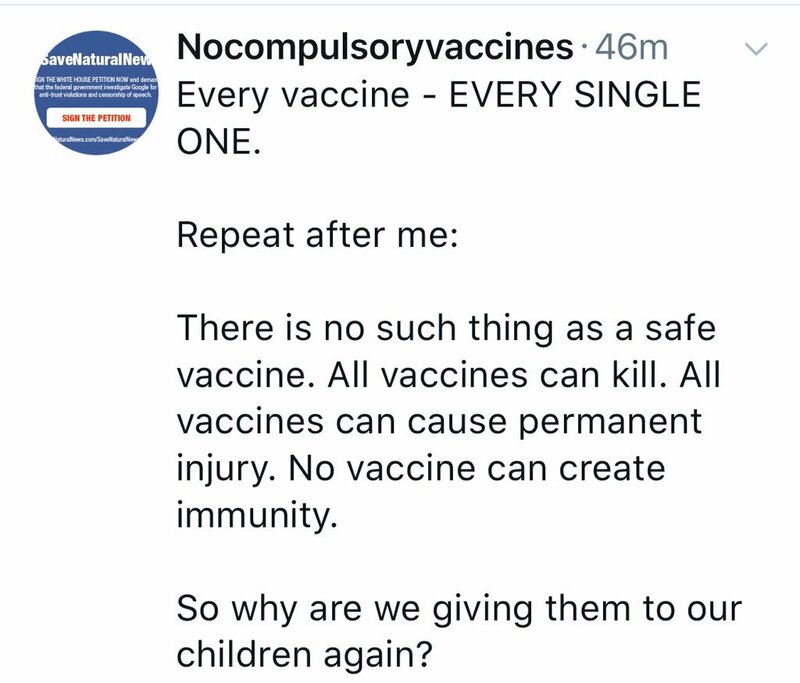 More so it is the unvaccinated who will suffer the consequences of widespread infection, whether in developing or developed nations. Indeed even with low levels of infection the unvaccinated, with an infection rate of approximately 90%, bear the brunt of infection. Australia’s anti-vaccination lobby has for years pushed fear and disinformation, spreading ignorance and apathy leading directly to low herd immunity and epidemics of vaccine preventable disease. This has resulted in effective legislative change manifesting as No Jab, No Pay and No Jab, No Play. The policy has been successful in raising vaccination uptake. The disease which requires the highest level of vaccine coverage to achieve herd immunity is measles as it is highly infectious. It is estimated that coverage of 92-94% is required for herd immunity from this virus. For this reason the national aspirational immunisation coverage target has been set at 95%. This target provides sufficient herd immunity to prevent transmission of other vaccine preventable diseases and supports Australia’s contribution to achieving measles elimination in the Western Pacific Region. Fortunately January 2018 has indicated measles notification the lowest in four years. Whilst measles continues to present challenges around the world, Australia should remain vigilant and ensure we keep ahead of any potential outbreak.